A wild Indian elephant, which had been trapped in swamps after being swept away more than 1,700 km into Bangladesh by raging flood waters, died on August 16 despite valiant efforts by villagers and forest officials to save him. ‘Bangabahadur’, meaning Hero of Bengal, died around 7 am at Koyra village in northern Jamalpur district, about 200 km from capital Dhaka. “We had mobilised huge manpower, provided it decent food and treatment but could not save it,” a forest department official familiar with the efforts to rescue him told. The elephant, which weighed 4 tonnes, had a heart attack – with stress, dehydration and electrolyte imbalance being factors, a local newspaper quoted a veterinary doctor as saying. It was separated from its herd on June 27 in Assam – where monsoon floods have made life difficult – and got washed away in the streams of mighty Brahmaputra to downstream Bangladesh. In Bangladesh, after it was thought to have travelled for nearly 1,700 kilometres, Bangabahadur was rescued on August 11 by a forest team following six weeks of frantic efforts. On its way from India, it was forced to stay in marshes as the highlands were occupied by flood-hit people who were unwilling to let the frightened animal share their shelters. The elephant entered Bangladesh through Roumari frontiers of northwestern Kurigram and then travelled miles to Jamalpur. It appeared agitated after being tranquilised more than once and moved indiscriminately for nearly an hour before it fell into a ditch unconscious during rescue efforts. 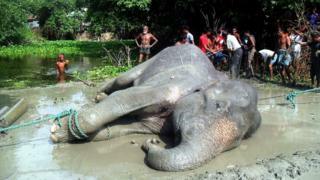 It died as a process was under way to shift it to the Bangabandhu Safari Park from the remote village. Officials had planned to bring in two trained elephants to support the transportation. Witnesses and people in the neighbourhood suspected that excessive tranquillising might have partly led to its death. They alleged Bangabahadur was provided less than what it deserved to eat as officials feared with regained strength, it could break the shackles and pose threat to the neighbourhood.